Less than a month removed from his unceremonious exit from the Canadian Football League, Johnny Manziel made his return to the field stateside on Sunday night. Manziel made his debut for the Memphis Express of the Alliance of American Football and showed some flashes of what made him such a brilliant player at Texas A&M. Manziel heard cheers from the home crowd as he jogged onto the field in the second quarter. And on his first play, he kept on a read option and showed a nice burst for a gain of 13 yards. Later on, Manziel hit Tennessee product Pig Howard for a 36-yard gain down the left sideline. In all, Manziel, who saw action on three offensive series for the Express, completed 3-of-5 passes for 48 yards while adding 20 yards on two rushes. That’s a pretty solid debut, especially after being with the team for just over a week. Manziel’s action came in relief of starter Brandon Silvers, who went undrafted in 2018 after an accomplished career at Troy. Silvers completed 24-of-35 passes for 266 yards and two touchdowns, including the game-winner in overtime as the Express completed a come-from-behind 31-25 win over the Birmingham Iron. Manziel, the 2012 Heisman Trophy winner, became the fourth player to see action at quarterback this season for the Express. Christian Hackenberg, formerly of the New York Jets, opened the season as the team’s starter, but was replaced by Zach Mettenberger. When Mettenberger, who started 10 games for the Tennessee Titans, went down with an ankle injury, Silvers was put into the starting lineup. The injury to Mettenberger opened up a spot for Manziel to join the team. Manziel was picked in the first round of the 2014 NFL draft by the Cleveland Browns, but his time in the NFL quickly fizzled out amid an array of off-field issues, including violating the NFL’s substance abuse policy and a domestic violence incident involving his ex-girlfriend. Manziel was released by the Browns after the 2015 season and did not return to the field until signing on with the CFL’s Hamilton Tiger-Cats in late 2017. Manziel was the No. 2 quarterback in Hamilton before he was traded to the Montreal Alouettes in July. In eight games for the Alouettes, Manziel threw for 1,290 yards, five touchdowns and seven interceptions while completing 64.2 percent of his passes. After his problems in the NFL, Manziel had to meet certain conditions in order to stay in the CFL. When Manziel was released by Montreal on Feb. 27, the CFL said it was found that Manziel had “contravened the agreement,” making him “ineligible to play in the league.” The CFL also said it would not sign off on a contract should any other team attempt to sign Manziel, effectively leaving him banned from the league. 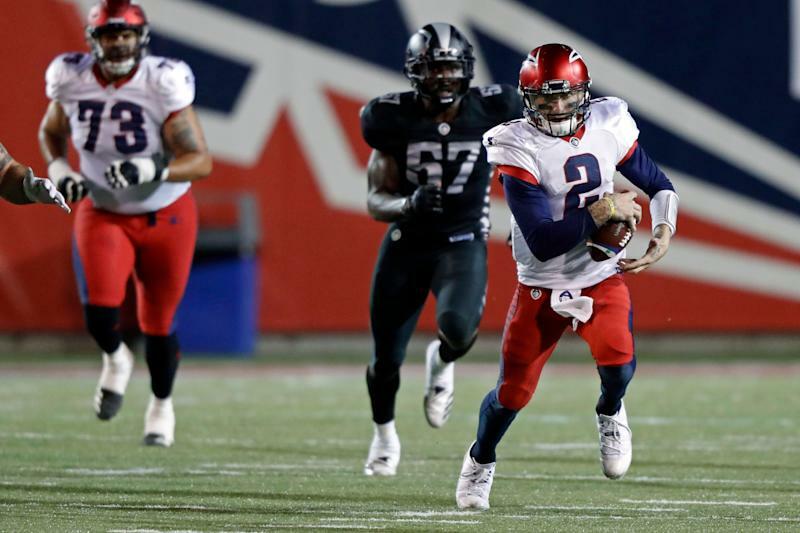 When Manziel’s time in Canada came to a close, it only took a few weeks for him to sign on with the AAF. His allocation rights initially belonged to the San Antonio Commanders, but they released Manziel’s rights, putting him into the league’s waivers system. From there, he worked out for a few AAF teams and eventually came to an agreement — the same three-year, $250,000 contract that every player receives — with Memphis. Memphis’ win on Sunday night improved its record to 2-5 with three games remaining in the AAF regular season.